Landowners frequently ask natural resource agencies how they can improve their land for waterfowl and other wildlife. Many people wonder if excavating ponds will help. 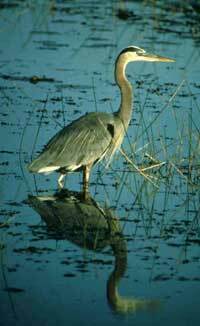 They often inquire about excavating, or deepening existing wetlands to provide more open water. This brochure will outline when and where dug ponds, or "dugouts," can be beneficial, and provides construction guidelines for optimum wildlife benefit. Should you consider a dugout for your property? It's well known that wetlands provide excellent wildlife habitat. Many wildlife species are dependent on or otherwise utilize wetland habitats, including waterfowl, wading birds, shorebirds and songbirds, furbearers such as beaver, muskrat and mink, and a variety of reptiles and amphibians like turtles, snakes, frogs, salamanders, and toads. It may be less understood that all types of wetlands, even those that don?t always have standing water, provide valuable, even essential, wildlife habitat. For example, temporary and seasonal wetlands typically contain standing water only during spring and early summer or after heavy rains. Yet these wetlands are very important for waterfowl during spring migration and breeding. They are usually the first to thaw in the spring and support thriving populations of aquatic invertebrates, which are an essential food source for ducks and geese during migration and egg formation. Seasonal and temporary wetlands are also critically important breeding areas for toads, frogs, and salamanders. Because these wetlands generally dry up later in the growing season, they are not inhabited by fish, which prey on amphibian eggs and larvae. Other wetland types that typically do not contain standing water include wet prairies, sedge meadows, scrub-shrub and forested wetlands. Again, these wetlands provide habitat for many wildlife species, including species of special concern such as yellow rails and bitterns. Even non-wetland wildlife such as pheasant and deer often rely on these "drier" wetland types for food and cover. Recognizing that all wetland types have potential habitat value, when is it appropriate to consider altering an existing wetland? The best candidates are those that have been either previously altered or degraded by drainage or sedimentation, or wetlands that have become dominated by invasive plant species such as reed canary grass and hybrid cattail. Dugouts should be considered only where other wetland restoration options are not possible. Before deciding to excavate a pond in an existing wetland, landowners should determine if other options, such as ditch plugs, tile breaks, or dikes would work. Wetlands restored by reducing drainage are always preferable to dugouts. Wetlands that have not been previously disturbed and that support characteristic native plant communities should generally not be altered. An alternative to altering existing wetlands is to create new wetlands by excavating in upland areas. This may be a viable option where the groundwater table is high, or the size of the surrounding watershed is large enough to maintain sufficient water levels. In the latter case, landowners should exercise caution if wetlands are already present nearby and should verify that the watershed can provide adequate runoff to support the additional wetland area. A final factor to consider is the surrounding landscape. If the main interest is providing nesting habitat for waterfowl, dugouts should be constructed only if there are other wetlands within one-half mile. Waterfowl use dugouts primarily for courtship and territorial sites, and must have other wetlands to fulfill feeding and brood-rearing needs. A complex of wetland types interspersed with upland nesting cover provides optimum waterfowl habitat. A mix of wetlands and uplands is also important for certain amphibians (toads, some frogs, salamanders) and for aquatic turtles, which lay their eggs in uplands. Check the permits and technical assistance page in this section.